Exploring the ocean is a wonderful experience, but we should always be aware that the ocean can be a dangerous place. If we are respectful of the ocean, then we can keep ourselves, and those around us, safe. When we are snorkeling, we are out in the ocean. The water can start calm, but there is always the chance that that could change. If the weather or water does change suddenly, then we should be ready to protect ourselves. A great snorkeling vest is one way to keep ourselves safe in the water Compared to a life jacket, a snorkeling vest is lightweight, allowing us to dive down into the water, and can be inflated and deflated at will, helping us to add buoyancy when needed. A good snorkeling vest is comfortable and can save your life. A top-rated snorkeling vest can be essential as a new swimmer, novice snorkeler, or child. The hard part is knowing what you should be looking for. Our buying guide will tell you everything you need to know about snorkeling vests. Finding the best snorkel vest can be hard, that is why we created a list of the top 10 on the market. Here they are. The SealBuddy life jacket for snorkeling allows you a non-bulky lightweight vest that adds buoyancy to your snorkel. This allows you to snorkel for longer without fatigue. 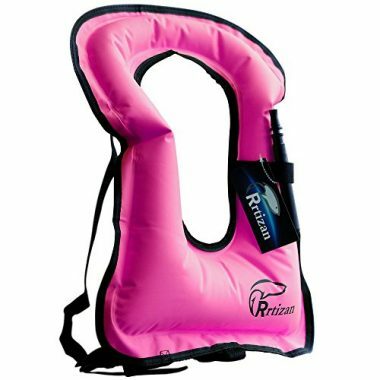 Straps secure you into this vest allowing you to easily move through the water without it riding up. 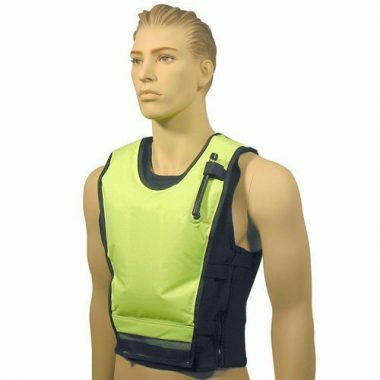 This easy to use vest simply slips over your head and easily attaches to your body. This vest will not make you feel bulked or weighed down while in the water. 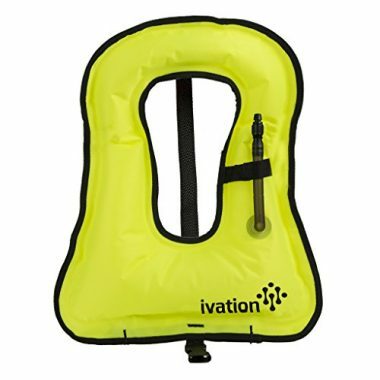 An oral inflator allows you to easily inflate this vest to your desired buoyancy level. Tear resistant material allows this vest to last you longer than ever before. A brass inflator will protect against rust for prolonged exposure to salt water. This snorkeling flotation device is great for travel and can be easily inflated when needing added buoyancy. This vest has a weight capacity between 100-180 lbs. Straps secure this lightweight vest to fit comfortably on your body. This bright yellow vest comes in orange as well allowing you to choose the color that works best for you. Waist and crotch straps secure this vest to your body for security in choppy waters. An oral inflation valve allows you to add buoyancy to your snorkeling experience. Available in a multitude of sizes and high-vis colors this snorkeling vest features a dump valve that allows you complete control of your snorkeling vest. ⅛” neoprene provides added comfort and warmth to your swim further protecting you. The thin fabric allows you needed protection from the sun. This snorkel vest fits those of a heavier size with a buoyancy weight of over 200 lbs. 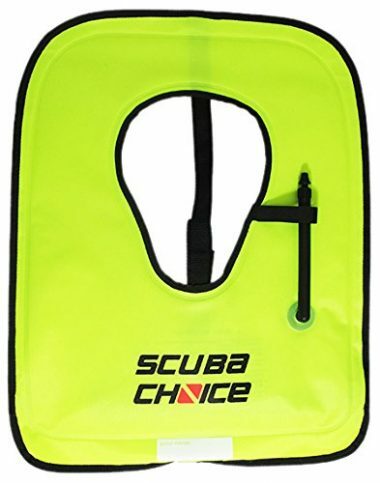 This neon yellow snorkel vest has a removable strap that prevents the vest from riding up. An oral inflation valve allows you to get as much buoyancy as is comfortable for you. Choose from multiple sizes and high-vis colors with this snorkel vest. This vest will provide added buoyancy while in the water without adding bulk. Waist and crotch straps secure this vest to you. A simple oral inflation valve makes inflating this jacket easy allowing you to choose your desired buoyancy. Available in multiple sizes, this snorkel vest has an oral inflation valve that allows you to control your buoyancy while in the water. Made using tough tear-resistant materials this snorkel vest is built to last. 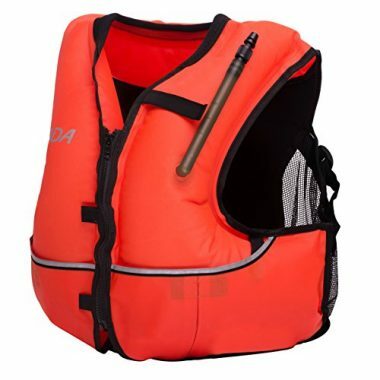 Comfortable and adjustable waist and crotch straps ensure this vest stays firmly on you even in rough waters. A removable strap allows this snorkel vest to no longer ride up. 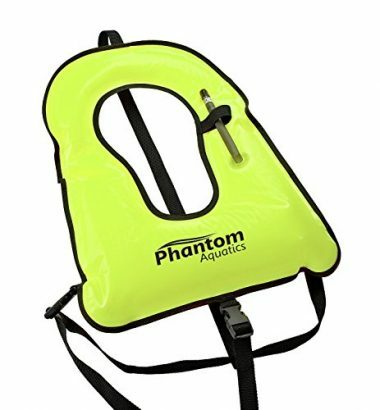 The highly visible bright yellow color will allow you to be easily seen in the water. Fitting anyone between 100-200 lbs this vest can be easily shared amongst the whole family. An oral inflator provides added help staying afloat in the water whenever needed. An oral inflation valve allows you complete freedom to determine your buoyancy in the water. A front pocket allows you to store a hotel room card or any other valuables you may want to bring. A comfortable neoprene back and an adjustable waist strap allows you to have a form fitting feel. Reflective tape as well as the bright neon colors allow you to be easily visible in the water. There are two main types of snorkel vest: horse collar and snorkel jacket. Both types have similar features, but there are some subtle differences which you should take into account when you are choosing between them. Both types have an internal bladder which can be inflated orally. Both also take advantage of durable materials. A horse collar vest fits over your head like a collar would on a horse. This type of vest is easy to use, but they usually only come in one size. This is not usually a problem as there are adjustable straps to ensure that they fit everyone, but if you are very short, then they can end up being too long. They are also smaller than the jacket style, so if you are looking for UV protection, then a horse collar is not the way to go. A jacket style vest offers more coverage. They protect you from the sun more, and they are also great for keeping you warmer in the water. Jacket style vests also come in a variety of sizes, so they are better for shorter people, though they are bigger, so they take up more space in your travel bags. You should look at the weight capacity when you are sizing and fitting your vest. If the vest cannot hold your weight, then it is not big enough. You should also make sure that the straps are long enough to go around your body parts. You should also make sure that you check out the sizing guides for different companies. Companies do not always size their gear in the same way. Snorkel vests are made from a variety of materials, but some materials are better than others. Nylon is a common material due to it being lightweight and the fact that it feels soft against your skin. Canvas is also used, but it is thicker and rougher. Canvas also absorbs water and can become heavy when you are in the water for a long time. Canvas can be beneficial when the water is cold, though. The thickness means that it can help you to trap more body heat. When you are buying your vest, it is always our recommendation that you spend a little more to get a vest constructed from high-quality materials. This will ensure that the vest does not irritate your skin and the vest is as durable as it can be. One of the main features of a snorkeling vest is to be visible in the water. When you are choosing your color, you may be tempted to match the rest of your snorkeling gear, but you should always remember that this safety device can help you to be rescued if you ever get lost or stuck in dangerous waters. 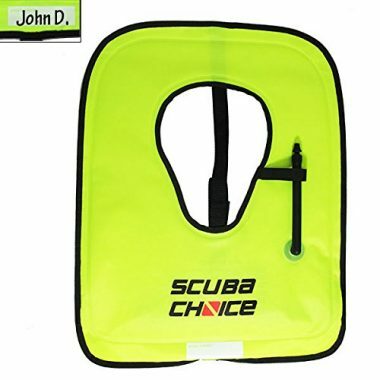 Neon colors, such as yellow, orange, and green are among the most common colors for a snorkeling vest. They are easy to see, and they show up against the darkness of the water easily. We recommend always choosing a brightly colored vest, but especially so when you are buying a vest for a child. If you can find reflective strips too, then you are only going to add to your safety. Not everyone lives at the ocean. When you are going snorkeling, there is a good chance that you are going to be packing up your gear and transporting it to the water. Many people also love to snorkel on holiday, so the traveling is often between countries and through the air. Snorkel vests are generally small and light, but if you are going to be traveling with your vest, you should make sure that the vest packs up as small as possible. When you come to secure your vest to yourself, there are a couple of options for fasteners. The main two are buckles and clips. Buckles are usually made from heavy-duty plastic and will hold up for a long time. Because of the lack of moving parts, buckles usually last longer than clips, but they are more difficult to use. That is not to say that they are hard to use, and they have the advantage of being more adjustable than clips. Clips are the easiest fastener to use, and we would recommend them for kids. This will allow them to get in and out of their own vests without any help. The only disadvantage of clips is that they do not last as long as buckles. If you are wearing a jacket style vest, then plastic zips will not corrode. Metal zips will last longer, but you should look for anti-corrosive coatings. 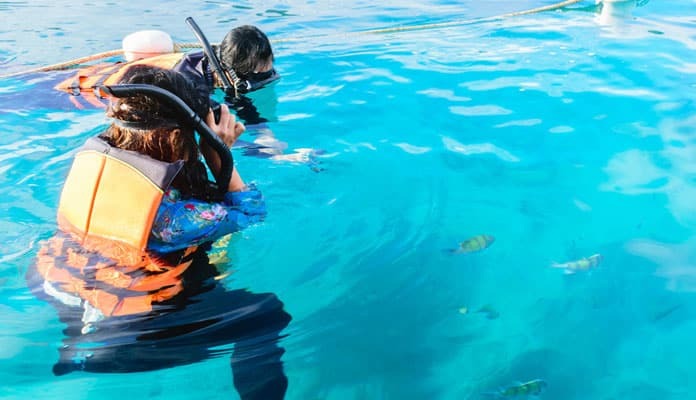 Snorkeling vests are specifically designed to be used when you are snorkeling, and you should not use them for other activities such as surfing or kayaking. When you buy a snorkeling vest, you should know that it can only be used for snorkeling. When you are looking for a snorkeling vest, you should always look at ones which have inflator tubes. Some older models have CO2 cartridge inflaters which we would recommend staying away from. These types of inflators can be dangerous so you should stay away from them. The most important thing to think about when you are looking at the inflator tube is the positioning. An inflator tube should be positioned so that you can reach it easily with your mouth when you have the jacket on. You should be able to inflate and deflate the jacket without taking the jacket off. Look for an inflator tube which folds away when not in use so that it does not get in the way, but can protrude when you need to inflate it. Q: What Is A Snorkel Vest? 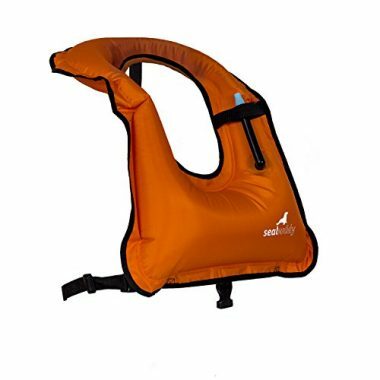 A: A snorkel vest is like a lifejacket, only smaller and lighter. They are designed to offer some safety in the water and to keep you on the surface of the water when you are snorkeling. They are inflatable devices which sit around your necking can be stripped behind your back to give a comfortable fit. They are light enough to be worn without noticing them. When they are deflated, they can go under the water without offering much buoyancy or resistance. If you do need some buoyancy, then you can inflate the snorkeling vest with air and add buoyancy. You can also find vests with additional features. One common feature of a buoyancy vest is the ability to add some warmth to your body when you are swimming. Q: Who Needs A Snorkel Vest? 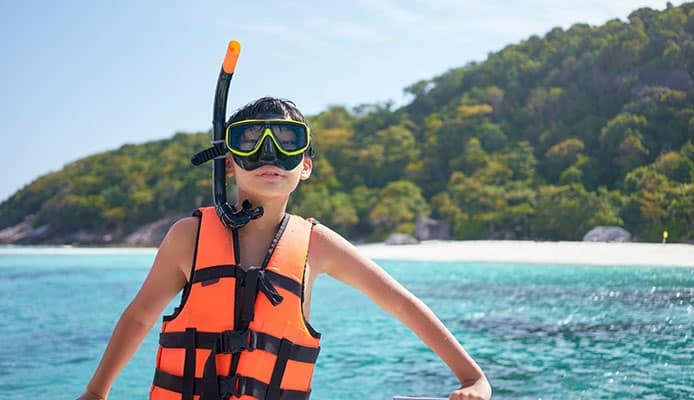 A: Snorkel vests are great for kids. They are also great for anyone who is not a strong swimmer. Finally, they are great for those who are starting out with snorkeling. If you are not a strong swimmer, then you can panic in the water, especially if you are trying to keep your head above the water. With a snorkeling vest, the panic is taken away and replaced by buoyancy. If you are starting out on your snorkeling adventure, then a snorkeling vest will help you to focus on mastering the equipment, breathing with your head under the water, and seeing the majesty of the underwater world. The great thing is that you can inflate it and deflate it as you see fit. Q: How To Size A Snorkeling Vest? A: There are two main things to think about when you are sizing a snorkel vest: the size of the vest and the capacity. When you are trying on our vest, you should make sure that your head fits through the loop. The vest should sit on your shoulders without aggravating you. You should also look at the buckles. They should loop around and fasten behind your back and under your legs. You should make sure that the buckles fasten and the fit is comfortable. When you are looking at the capacity, you should find a vest which will support your weight. The vest should also be big enough that it covers a lot of your torso so that it helps you to float horizontally. Q: What Are The Benefits Of Using A Snorkel Vest? A: There are many benefits to using a snorkel vest, and when you do get one, you should make sure that you get a high-quality vest. A good snorkel vest will be lightweight and not get in the way when you are swimming. It gives you the freedom to dive down deep into the water when it is deflated and keeps you on the surface of the water when it is inflated. 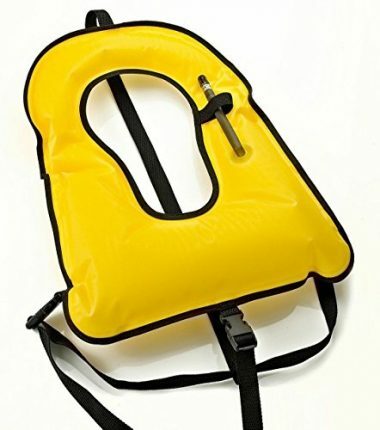 One benefit over a life jacket is that it can be inflated and deflated with ease. When the water gets choppier, you can add some air, and when it calms down, you can let some air out. Snorkel vests are also brightly colored. If anyone gets lost while wearing a snorkel vest, they will be easy to find. Q: Why Should I Get A Snorkel Vest? A: The main reason you should get a snorkel vest is to protect you in the water. 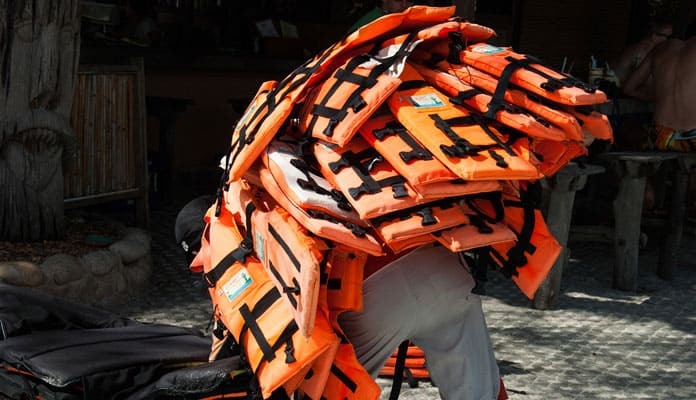 When you compare them to lifejackets, they are smaller and lighter. This makes them great for traveling. They will not add any weight to your bag, and they will not take up much space. They often offer you extra warmth in the water, and they help you to cover up and shade your skin from harmful UV rays. Q: How Do You Operate A Snorkel Vest? A: To operate your snorkeling vest, you should first make sure that it fits tight on your body and that all of the fasteners are fastened. When you are in the water, if you want to inflate the vest, you should take the inflater tube and place it in your mouth. When you blow into the inflator tube, the vest will begin to inflate. If you want maximum buoyancy, then you should inflate it all the way. You can also inflate it as much or as little as you want. To deflate the vest, you should be able to press in the inflater tube, and the air will be purged. Any of the top 10 snorkel vests we listed above will help you to get the most out of your time exploring the ocean. 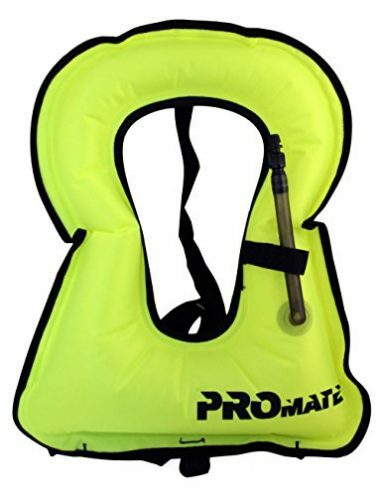 All of our vests will protect you and your family when they are in the water. One of the things we like about wearing a vest is that you can inflate it when you need a rest. After a lot of exploring, you sometimes want to come up for air and tread water for a while. This can be tiring, and you can expend energy which could be used for more exploring. By inflating your vest, you can float in the water without having to expend any additional energy. Our buying guide will equip you with the knowledge you need to make an informed choice on a snorkeling vest. When you have one, you will wonder what you did before. Take the time to decide what you need from a snorkeling vest, and then chose one of the top-rated vests from our lift. Stay safe out in the water, and have fun. Do you have a snorkel vest that made it on our list? Let us know how you like it in the comment section below.